How did we survive without cell phones? I know a lot of people wonder this fact when they are out in the backcountry and need help. While no one really plans for an emergency, the key to survival when you cannot get a signal is prevention and preparation. One of the easiest things one can do is to prevent a problem when camping and hiking. A common problem arises when beginning campers and hikers do not know how to read a map. Yes, I know this skill sounds simple but you would be amazed at how many people really do not know how to read a trail map. They assume they can just walk down the trail and then go back up but……..if you have ever been in the woods you will notice something. After awhile everything looks the same. Your cell phone does not get a signal, you have no compass, and the map you have really does not make sense. Once you get to this point, there really is nothing you can do but signal for help. A common pattern for S.O.S is anything is threes. This can be three toots of a whistle, three stones laid out, three fires or even the outline of the letters S.O.S, which comes in threes. But there is another choice and that is prevention through preparation. Knowing your strengths and weaknesses of your camping and hiking skills is a start to preventing a problem. In the situation described previously, the problem could have been easily solved by tying orange hunting tape along the path you took. Once you reached where you wanted to go, all you would have had to do was follow the tape back to your starting point. 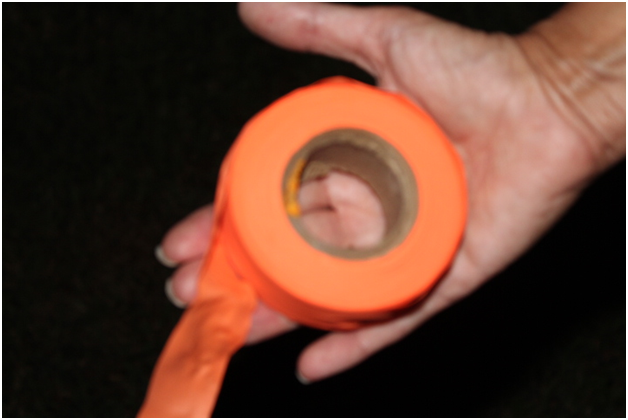 Yes, the process works but do not just use any orange tape unless you want to hit the trail again. What I mean by this is the fact that some marking tape is not biodegradable and in doing so goes against the idea of “leave no trace.” To abide by this rule, always make sure that the marking tape you use is biodegradable. The last safety tip is to always let someone know where you are going and when you expect to be back. If you do get lost, this gives individuals a starting point by which they can start looking for you.